In Christchurch, seventeen year-old Laura Chant is walking home with her younger brother Jacko when they encounter the strange Carmody Braque who sells toys out of a container. While there, Carmody places a stamp that has his face on it on Jacko’s hand. Laura is disturbed by this, especially when the stamp will not wash off and Jacko starts to become ill. She becomes increasingly concerned as Carmody continues to lurk around their home, although realises that he cannot enter unless she invites him. At the same time, Laura is given warnings by fellow pupil Sorensen Carlisle. As she turns to him for answers, Sorensen reveals he comes from a family of witches. They tell her that Carmody is a lemure that is able to stay young by taking control of another’s body and that Jacko is his intended victim. Under the guidance of Sorensen’s family, Laura begins to realise her own powers as a witch and seeks to make the changeover that will allow her to fight back against Carmody. The connections don’t end there. The film is co-directed by the husband and wife team of Stuart McKenzie and Miranda Harcourt. I have the distinction of having gone to school with McKenzie (although it wasn’t for a very long time – his father was the vicar in the town where I lived and they moved overseas – and I have zero memory of his face or any interactions with him), before he went on to become a playwright and director of several short films. Miranda Harcourt has become one of the top actors in New Zealand and has done some sterling work on stage and screen. I also had the opportunity to be able to sit down and interview her about her career for a newspaper article several years ago. Margaret Mahy (1936-2012) became one of New Zealand’s most internationally celebrated authors. A former children’s librarian, Mahy began publishing in the 1960s with A Lion in the Meadow (1962) and produced a long list of works since then, ranging between illustrated children’s books and works that these days would be classified as Young Adult novels such as The Haunting (1982), The Changeover (1984) and The Catalogue of the Universe (1985). Mahy received numerous awards for her work. The surprise about The Changeover is that it is the first of Mahy’s works to be translated to film. There had been earlier tv adaptations of her works with Aliens in the Family (1987), The Haunting of Barney Palmer (1987) and Maddigan’s Quest (2006) and she had created the tv series’ Strangers (1989) and Typhon’s People (1993) but this is her first feature film. The problem I had with the film was my reading of the book. To me, it seems to take place in the same mumsy Christchurch of the 1980s I knew – a world of school uniforms, fish’n’chip dinners, a bookstore in every block of shops, of Space Invaders parlours. That’s the picture Mahy conjures reading the book and its a familiar world to me. The problem is mine but it seems jarring to get a version of the story taken away from that world and relocated in the modern world set after the earthquake that devastated Christchurch in 2011 where the characters watch modern tv and use cellphones and with modern Kiwi pop songs on the soundtrack. 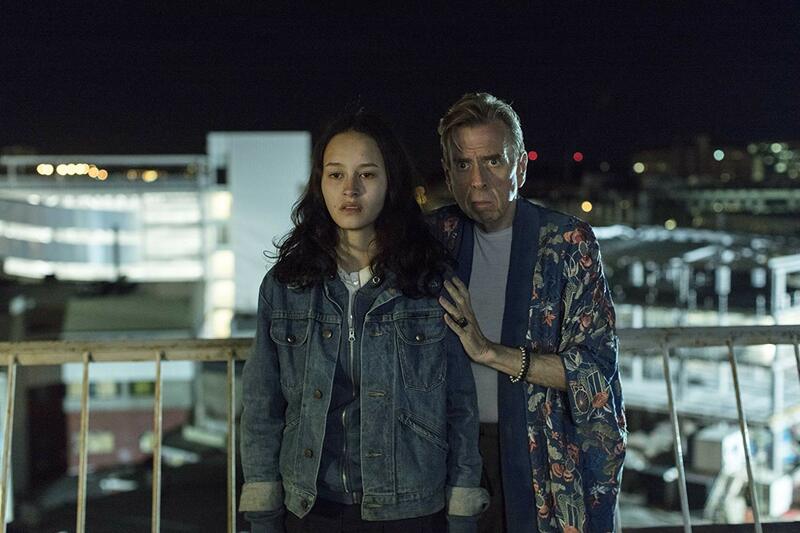 The main problem with The Changeover as a film is that it’s tone is no longer that of the New Zealand of the 1980s when Mahy was writing; it is a film that is aiming to be just another modern Young Adult work about a witch coming into her powers. And it feels by the numbers. Laura’s journey to make the changeover is not the emotional core of the book; it is just another familiar story arc with no real emotional depth beyond a series of artful soft focus editing cuts. Mahy’s novel dances with the pure delight of her writing. She has a sublimely poetic turn of phrase with her descriptions and writes sharp character observations that make you gasp – it’s a book that can be enjoyed just as much by adults as its’ intended YA audience. However, when it comes to the film, it feels as though Mahy’s writing has been stripped down and the story takes place on the level of a Cliff’s Notes synopsis of the plot. Carmody becomes just another black hat sorcerer and Sorensen has been stripped of all his background and complexities and simply becomes a standard romantic lead. Mahy’s story has become no more than another earnest soft-focus YA film and one where much of the plot that has been rehashed by other YA works like The Seeker: The Dark is Rising (2007) or Beautiful Creatures (2013). I was disappointed with The Changeover. Erana James is okay but far too quiet a presence. She should have been the emotional centre of the story and carried it with her determination but James just seems too timid and quiet with her performance, as though suffering from being camera shy. Of the name actors present, both Melanie Lynskey and Lucy Lawless, who have done fine work elsewhere, feel underutilised. The filmmakers have brought in British actor Timothy Spall who comes with a sterling reputation. I don’t know if Spall has played a bad guy before but it is interestingly creepy seeing him turn his customary fuddy stammering ineffectuality towards something sinister – he has an especially unnerving trick where he speaks through other people’s mouths. That said, Spall’s performance takes a serious dent in credibility in the head-scratchingly distracting decision to have him play the climactic confrontation scene out while wearing what looks like a woman’s floral print bathrobe – if there is any other item of costuming designed to dilute the villain’s threat then I’d be interested to know what it is. The one thing that does hang over The Changeover is Christchurch. I am glad that Miranda Harcourt and Stuart McKenzie retained faith to Mahy’s original setting rather than reset the story elsewhere (which it easily could have been). The main problem they are stuck with is that a modern version of The Changeover has to be relocated in post-Quake Christchurch (although I guess it would have been hard to make the film any other way). The ruined city makes itself known in every way from characters walking along cracked sidewalks and through waterlogged streets, houses plastered with ECQ stickers, people living out of containers and areas of the city still fenced off. It’s hard to imagine what someone outside of Christchurch would make of it – and it is certainly a depiction that Mahy herself would never have envisioned – but it creates an undeniable snapshot of a still-wounded city.